Some of the best French presses. 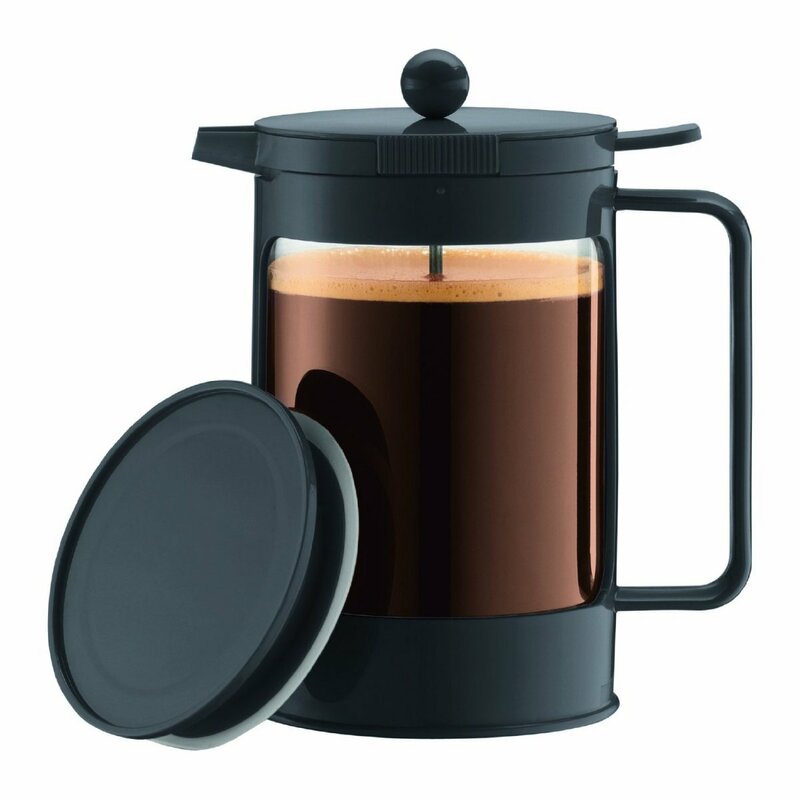 If you want fresh coffee, fast, there is nothing better than a French press coffeemaker. As soon as the water is hot enough, it is simply a matter of pouring it into the carafe and waiting for three or four minutes. Compared to almost any other method, it is a near instant brewing process. There is a guide below for people unfamiliar with the method. 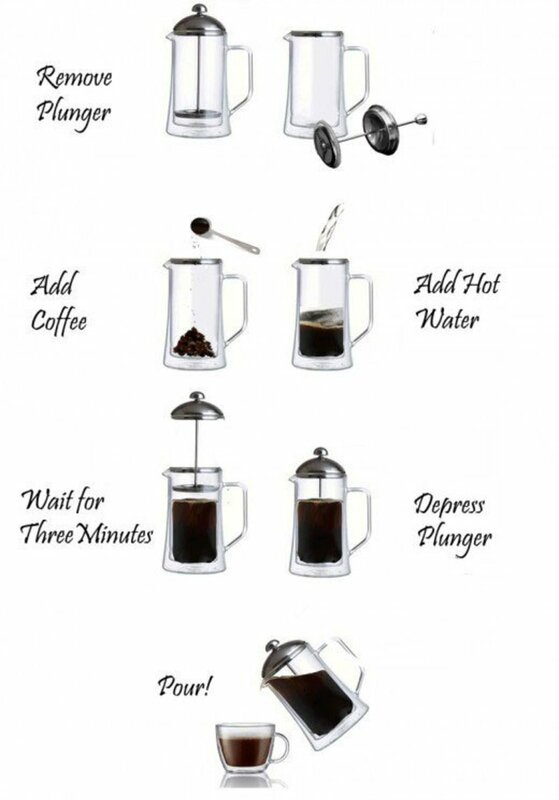 How to Brew Coffee in a French Press. 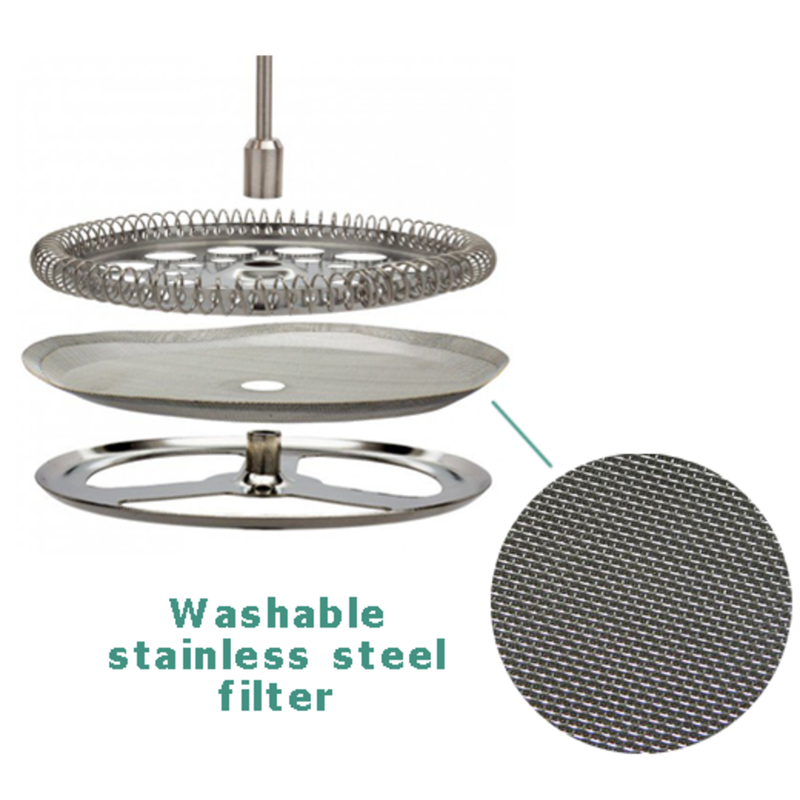 The easy to clean stainless steel mesh filter makes the filtration process fast. For the best results, you need to start with the right coffee that's stored in the right way and ground to the right size. It is best to roast your own beans or buy freshly roasted coffee in small quantities then store carefully and use quickly. Coffee flavors are easily be ruined by mistreatment. Most of the flavors that we value come from the aromatic oils in the beans. Oils of all kinds spoil if they are exposed to air or to too much heat,. Bitter flavors can easily result. 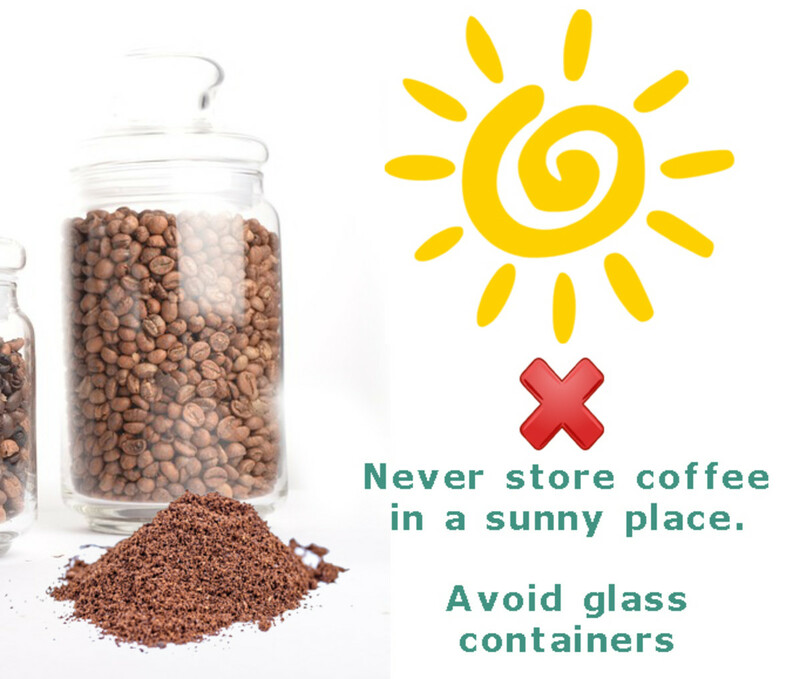 If you keep roast coffee in a glass jar on a sunny window shelf with a loose-fitting lid it will spoil in hours. Vacuum-packed coffee of the kind specifically ground for a French press, is a good option for busy people. 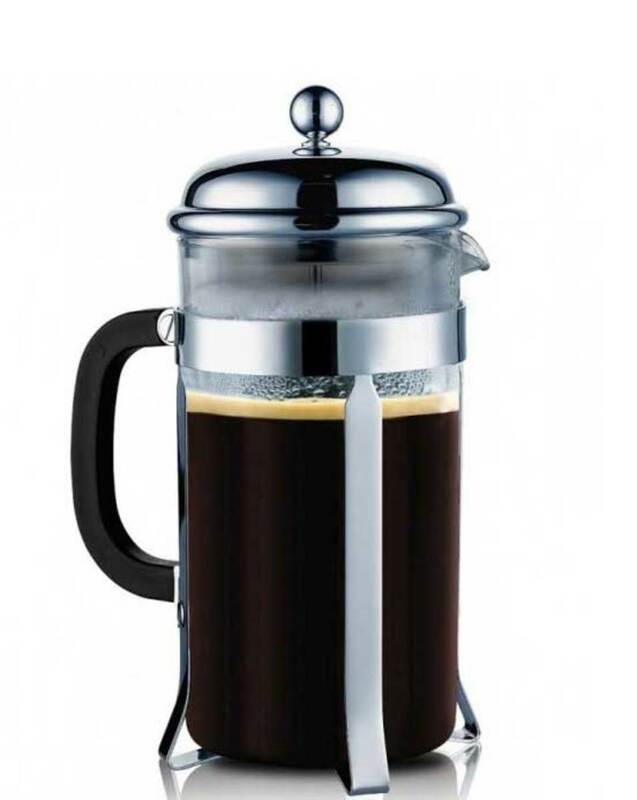 If you are out of your home in a hurry every morning, this kind of coffee will brew fast in a French press and is a huge improvement over the instant kind. You can even brew directly in specially designed travel mugs! 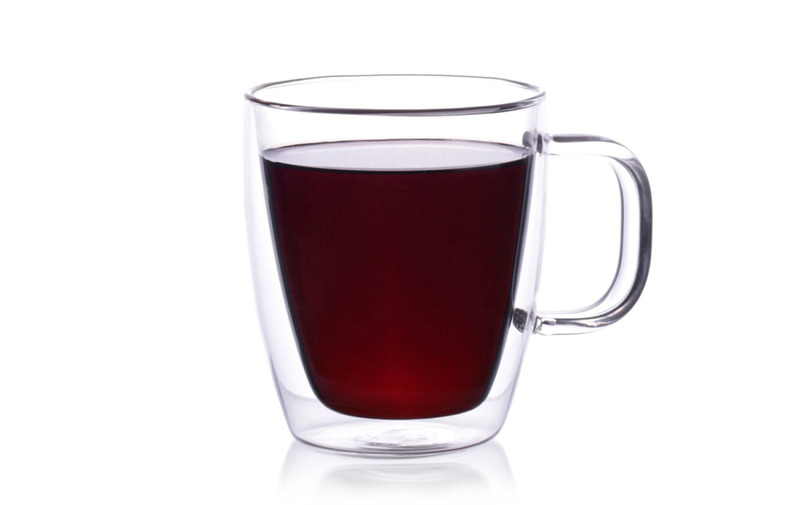 The iconic Chambord from Bodum. 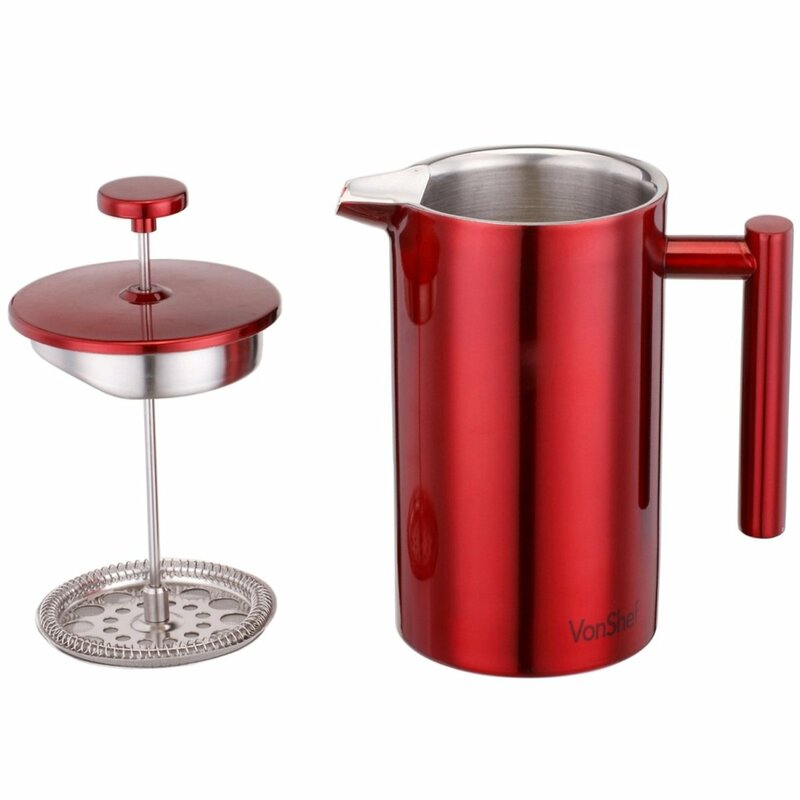 The venerable Bodum Chambord is one of the most famous designs in the world of coffee-making. I bought my first over thirty years ago, after being served fresh coffee in a Chambord during a visit to London. Never having seen one before, I asked the waiter how it worked. He explained in about thirty seconds and, after tasting the result, I was sold. 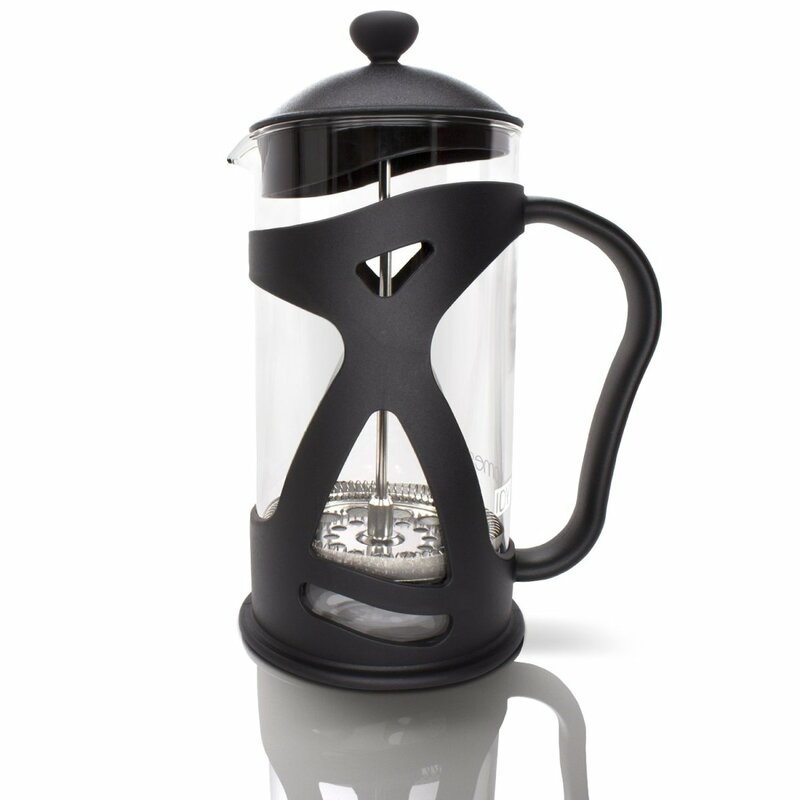 The Chambord is still one of the most popular designs of French press. 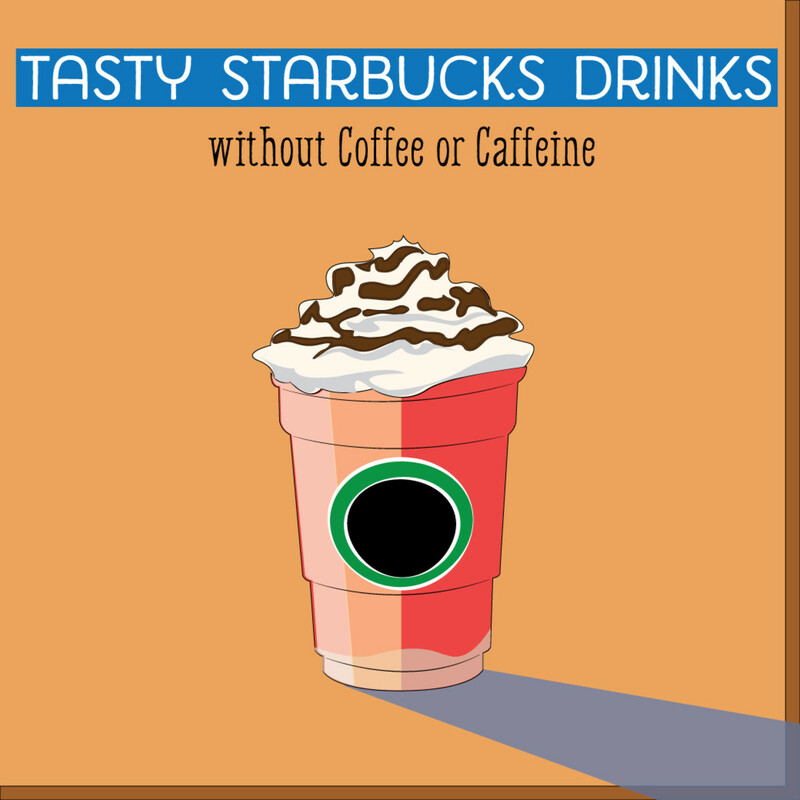 It comes in every size, from the 12-cup down to the 3-cup. The frame is chrome-plated brass, of a good enough quality to stand up to heavy use over many years. The tempered glass carafe pulls out of the frame very easily for cleaning. The stainless steel filter is replaceable. It is dishwasher-proof in its entirety. Note that none of the coffee makers on this page (including the Chambord) can be used on a stove top. The glass is tough, but not that tough! The Bodum Chambord is available in three, four, eight, and twelve-cup sizes. Keep in mind that "cup" here means one of those rather small cups that you find in many up-market restaurants. If you drink your coffee by the mugful, a three-cup press will only give you enough for one serving. 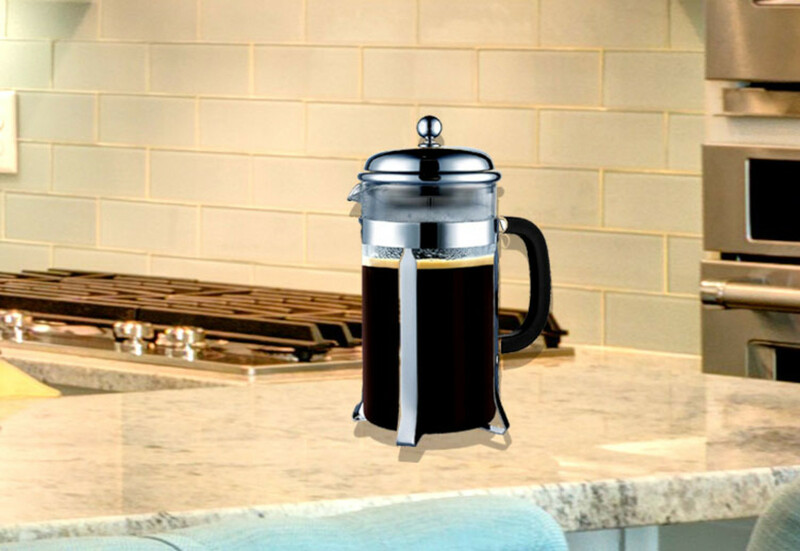 The Sterling Pro glass French press. As you can see from the picture above, the makers of the Sterling Pro have cleverly based their design on the classic Bodum Chambord. However, the Sterling Pro offers a double layer filter to reduce the amount of coffee grounds getting into the brew. 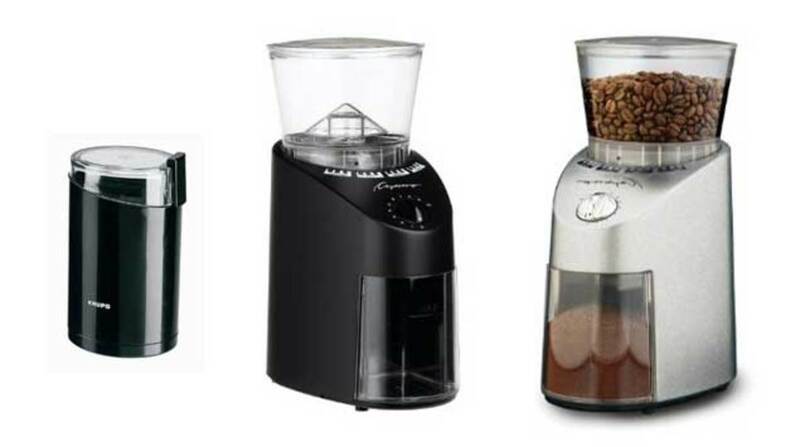 This can help if you are grinding your own coffee and do not quite get the perfect particle size. Having said that, in my experience, the Chambord filter only allows grounds through as it ages. When you start to notice this happening, it is time to get a new filter. 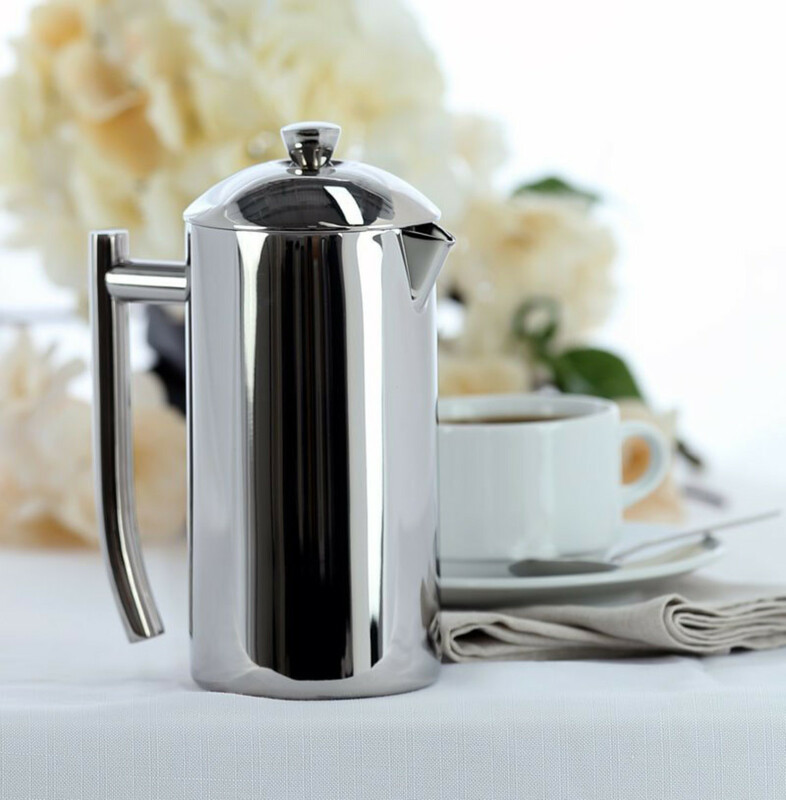 The eight-cup version of the Sterling Pro is now the most popular French press to source online. If you are not a traditionalist, and want to save a few dollars, it is certainly worth consideration. It is similar in design to the Chambord above but the curvy design and tough plastic frame make it a good choice for less formal settings. 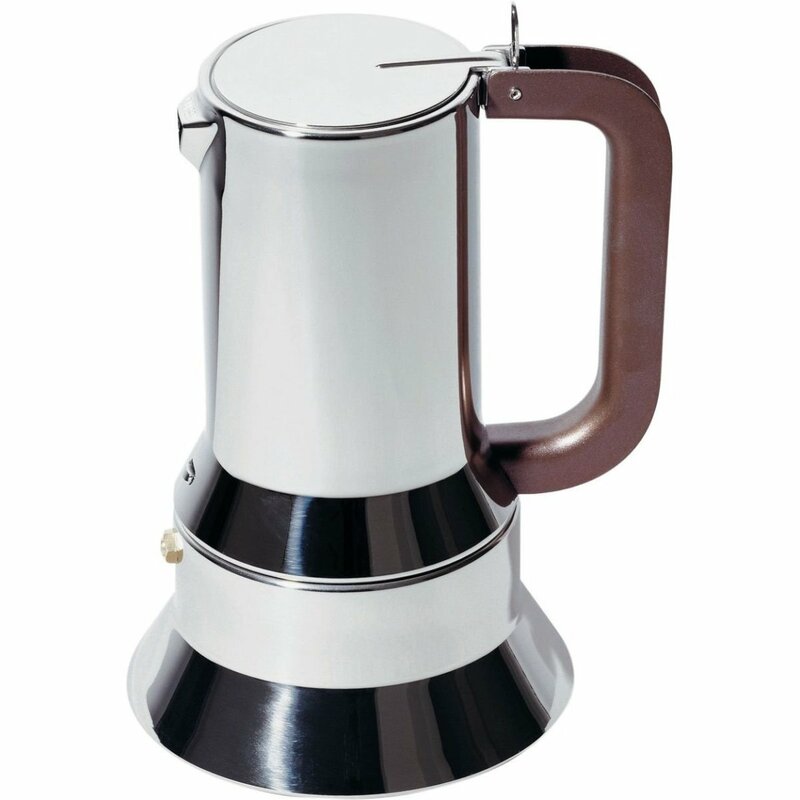 The Grosche Rome is one of the more recent French presses to arrive in the US. The broad base means it is hard to knock over. Vacuum flask and press combined. For purely practical purposes, this is one of the most successful press pots available. It is not only hard to break, it is hard to scratch. The stainless steel container is well-protected within the tough plastic handle unit. 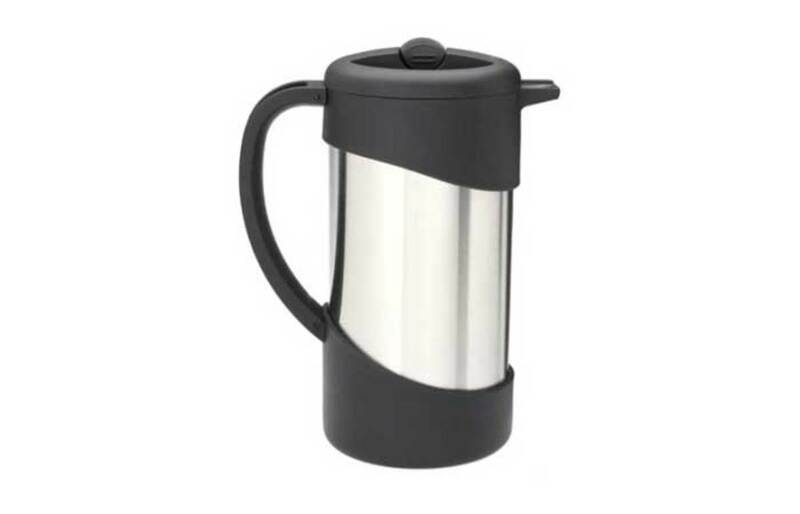 Best of all, the vacuum flask will keep coffee hot for a long while after it is made. The makers say two hours but one hour is closer to the truth (good enough for most people). Double-wall Sterling Pro keeps coffee hot longer. Sterling products are not always the most innovative but they certainly learn from those who went before them and often take an idea one step further. This model pictured above has the same double screen filter as the glass Sterling Pro with the benefit of an almost unbreakable stainless steel construction. 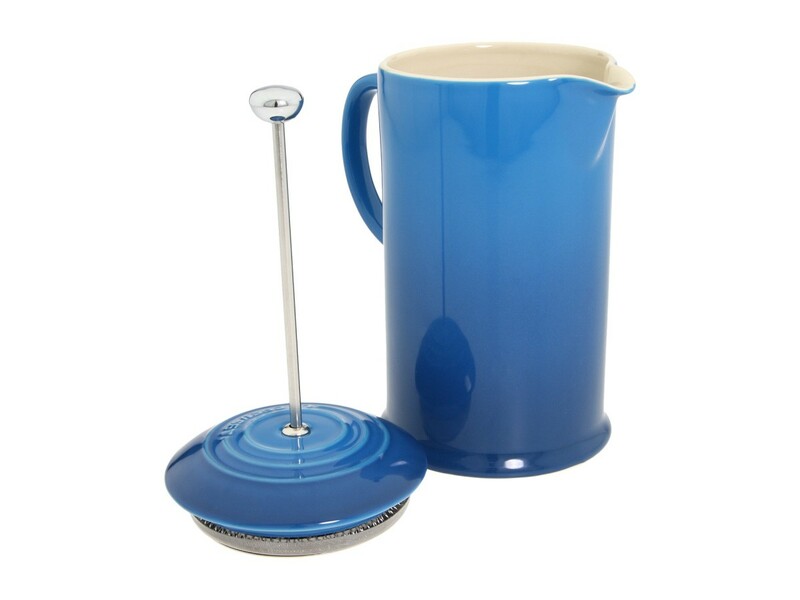 The double wall design has good insulating qualities that will keep your coffee warm for longer and save you from painful brushes with hot surfaces. In the summer time, this kind of carafe can be a great way to keep iced coffee cool. The top plunger button is big which makes it easy to depress without hurting your hand. It is a genuinely elegant product and sits well in any modern kitchen. Tough stainless steel contruction, big comfortable handle from Freiling. 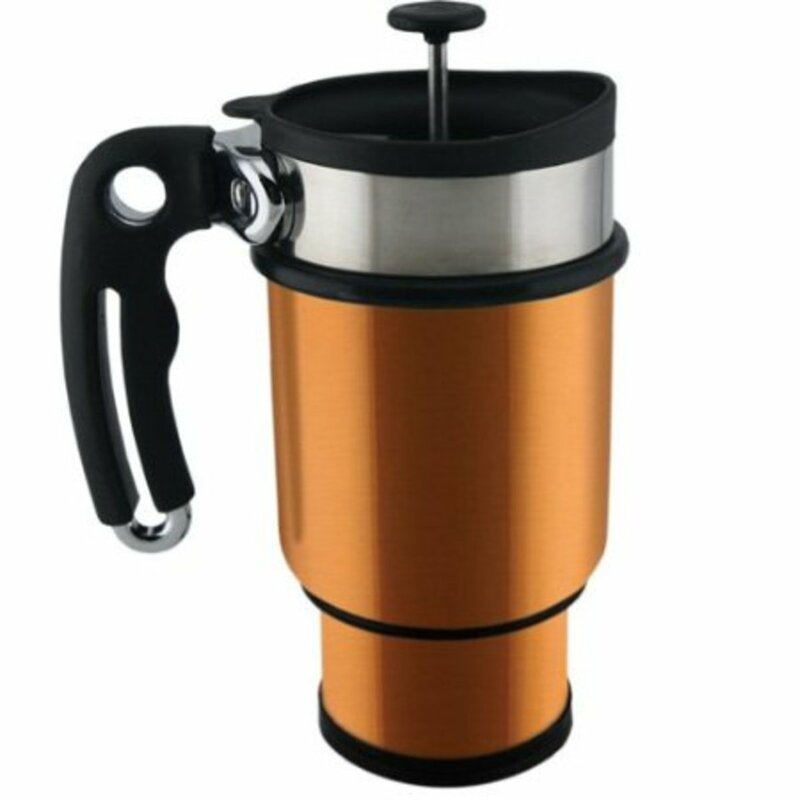 The Frieling French press is available in various sizes and offers some valuable features, including an insulating, double wall construction. Some people will like the matching creamer and sugar bowl. As with all stainless steel, the highly polished surface will need some care to keep free of tiny scratches. It is new new to me right now, so I cannot give you much feedback except to say that VonShef is well known for quality kitchen appliances. Drop me a line in the comments below if you are try it. Stoneware press with stainless steel plunger. My family are big on gifting reliable presents that they know will last. I have had more French presses for birthdays and Xmas than I can probably use in a lifetime but I have been pleased with every single one. The Stoneware Press from Le Creuset, pictured above, is a favorite for displaying in my kitchen and that wonderful color will never fade. 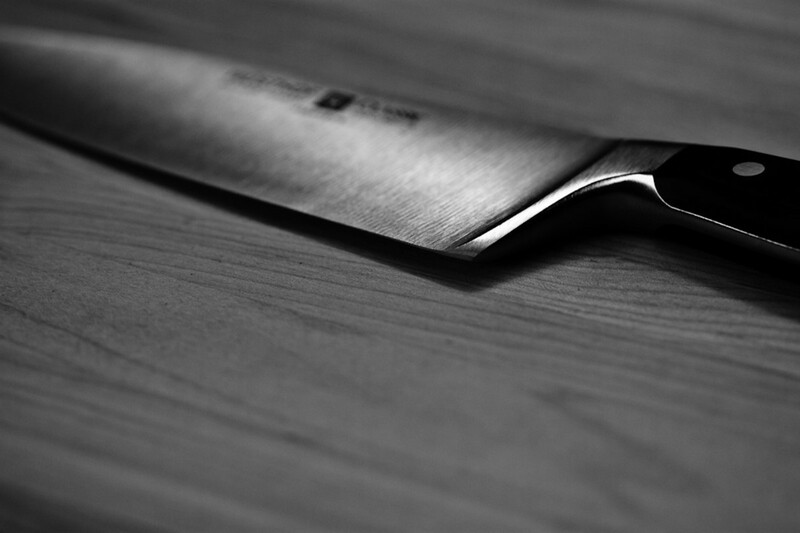 The ultra hard surface (your best kitchen knife will not scratch it) is easy to keep clean. It is also very difficult to chip. The downside of stoneware is weight, but these French presses from Le Creuset are not much heavier than other similarly-sized stainless steel pots, and the big, well-designed handle makes it easy to use. I was a little disappointed to see that the product is Chinese-made but then the Chinese have been making stoneware for nearly four thousand years. If they could produce masterpieces during the Shang Dynasty, I think a French press is well within their capacity. There are three colors available presently, which you can see below. 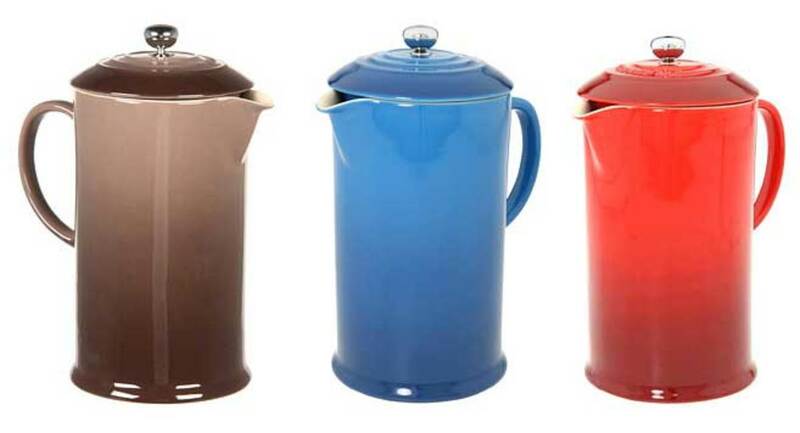 Matching coffee storage pots are also available. These are wonderful for those morning journeys. They are also useful in workplaces where the coffee is terrible! Double-wall stainless steel travel presses. 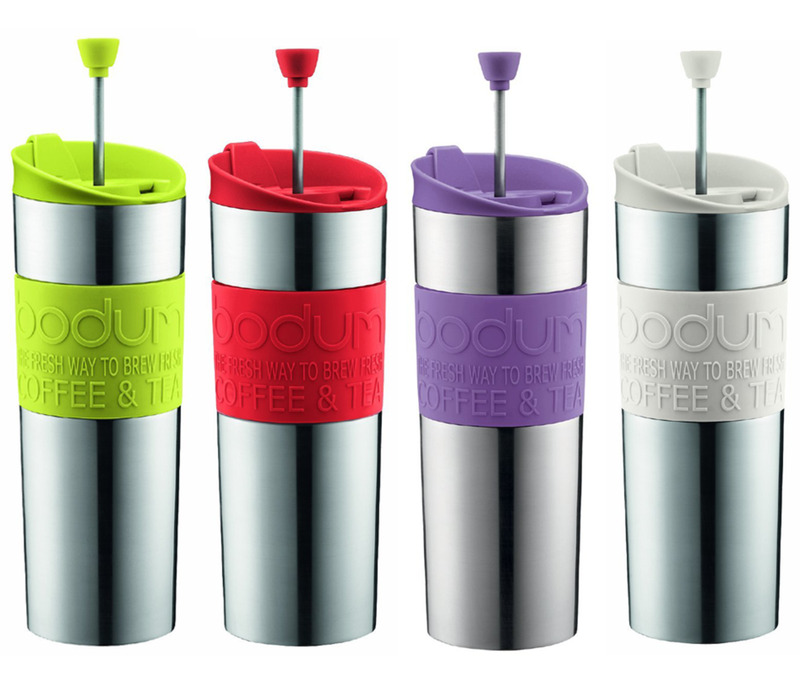 If you like to leave your home in the morning with coffee for the journey, a travel mug is a must. There are plenty to choose from these days. If you like bright, cheerful and, almost, indestructible, designs, one of the Bodum travel presses, pictured above, could be for you. The double-wall construction keeps the coffee hot and your fingers safe. Making the coffee directly in the mug/press saves time. Plenty of other colors available. The travel mug pictured above is from Planetary Design, and it will fit into most cup holders. It is made from cuisine-grade stainless steel with an insulating double wall. The lid helps stop spillages. There is even room in the bottom to keep extra ground coffee which is a big plus if you need good coffee in an office with just instant. The colors available are black, green tea, paprika (pictured), and pink. The big handle helps you to drink the coffee, but it does take up a lot of room! If you need a really detailed guide to making French press coffee, the video below should fit the bill. Need a Huge French Press for Iced Coffee? I was initially skeptical about using a French press to make iced coffee. However, with practice, I've found that it delivers some of the best ice coffee I have ever tasted. The huge, 1.5 liter Bodum Bean Ice pictured above, is an excellent way to have iced coffee ready to drink throughout the day. Making the coffee is simple: follow the normal procedure for a press, but use cold water and leave it to steep overnight in a fridge before filtering. An extra lid is supplied, meaning that less space is required in the fridge, since you will not have to find room for the plunger. Iced coffee is fine in summer but a cold cup on a cold morning is a let down. Warming your mug with hot water before pouring in the coffee will help. 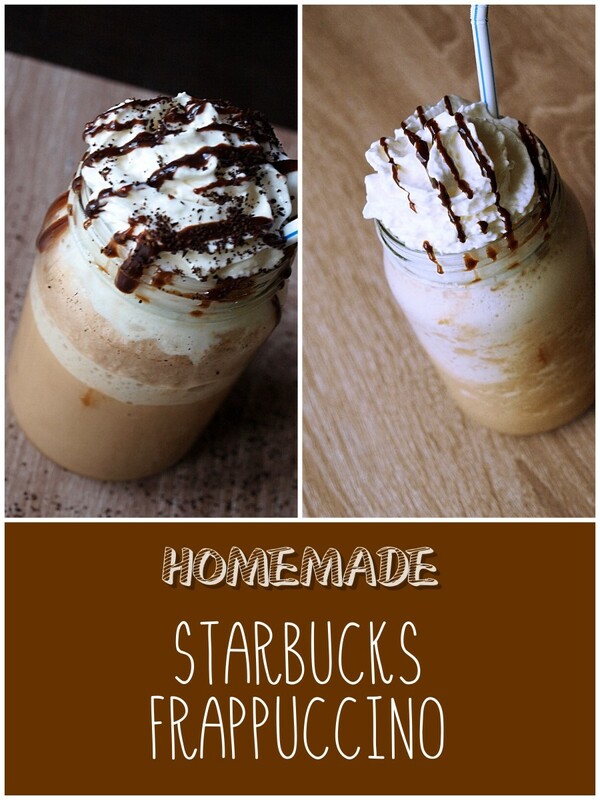 Another way is to use a double-walled coffee mug from a maker like Eparé or Bodum. These are tough mugs made of hardened glass that is hard to break or scratch. The double wall keeps your drink hotter, longer and also means the outside will not burn you. They are useful for iced coffee too, preventing condensation and pools of water forming on a table top. Why are you interested in a French Press? Never tried French press coffee but I am curious. Regular user looking for latest choices. Tired of stewed, stove-top coffee. Espresso is making me bug-eyed. Can I put my Le Creuset French press on the stove on low? Stoneware is often used for cooking in ovens but is not recommended for use on a stove top. In ovens, the stoneware will heat evenly, but on a stove top the base will get hot while the top stays cool (stoneware is not a great conductor). A big temperature difference can result in the stoneware cracking. I'm downsizing, so need to get rid of my big ole' Cuisinart coffee maker and hoping the French press will serve my needs as well. Hoped to see comparisons in how the coffee turns out in each press, but appreciate the overview. I am always in the market for a coffee press. I just got one for our trip. I always give it away each time I leave one assignment. The Bodum is the one that works well. I was able once to get one that is not made of glass. This is the most practical for me. 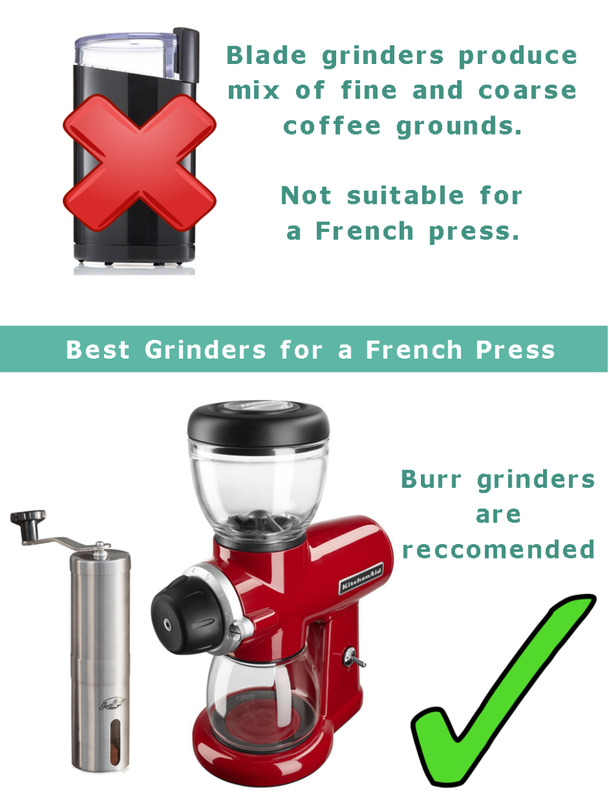 Your "Quick Guide to using a French Press" is completely wrong -- don't push down the plunger until the coffee has had time to brew! I had a chance to check out one of the new stoneware presses a couple of weeks ago and was impressed. Then, I delayed updating this page because, I couldn't get a quality picture (bad excuse I know). So thanks for putting the issue back in the forefront of my mind. You can see the result above. They are still a very new product, of course, but as long no reports come in of flawed manufacture (the ones I saw were perfect), I reckon I will be buying one myself. 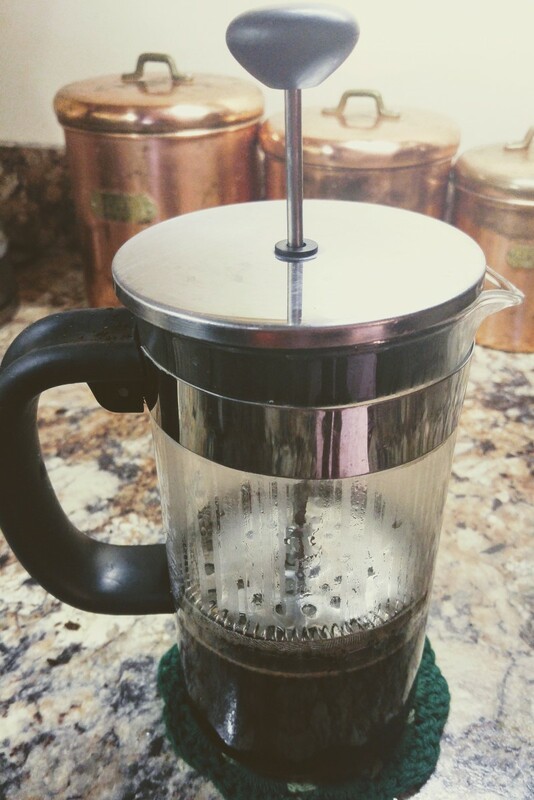 My wife and I have a habit of breaking the glass ones and came across the newer Le Creuset stoneware French press - they are priced in between the stainless steel and glass, have you had/heard of any experience with them? Nice hub. I just linked to it in my own hub about manual home-brewing methods! Great work. Was just about to buy the Frieling one as I'm tired of spending money on broken glass but then I found this. http://greenlivingqa.com/content/stainless-steel-l... As we all, already have much metallic intake from many other sources, i decided not to add another one to my diet. Thanks for pointing out that problem, Vanessa. I added a quick guide to the page above which should make things more clear even if the video glosses over that detail! you know what i don't like about this video? you don't show the part where you add the coffee to the french press? i was under the assumption that you put in the coffee and then put the press in there and then add the water. see, you're not clear about this in your video which makes it hard to understand for people who never used a french press. I like real, hot coffee, so I warm the cups on a cold day! One thing that helps the process is to put hot water into the press before everything else...after you grind the beans and heat up fresh filtered water ( best ) then pour out that water and put in your ground up beans and add fresh hot water...steep 4 minutes and you're good to go. I like the way the glass pots look. Thanks for sharing. Thanks for reminding me of the Bodum thermal pot, Jonsky. I went ahead and included it. 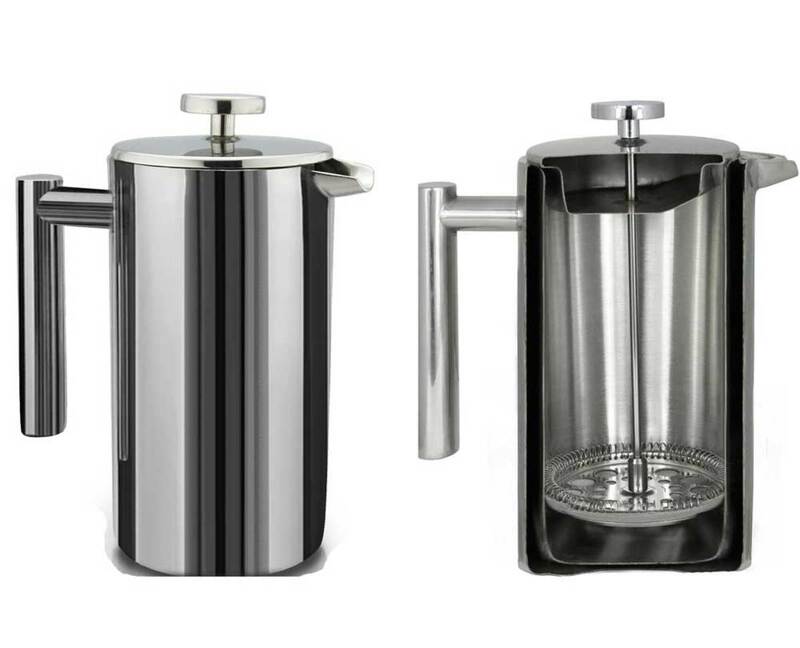 I like the look of the Frieling better but I reckon plenty of people would choose the curvy beauty of the Bodum. I love the Bodum Thermal Press Pot; it keeps my coffee hot while I let it steep. Looks similar to the Freiling though. French presses are so classic. The coffee seems to taste more flavorful with a press. I notice a difference from when I'm drinking my chronoscoffee blends from a press versus a coffee maker. I like how will says his impressed the ladies! Way to go. Ah ha! This explains why my son in his late 20's went out and bought a Bodum! Actually, even I was impressed with his coffee grinding and the press - I said wow (but I did wonder about this)! Now he and his new wife of 2 years have their own Bodum. Thx for dropping by Bk. I have a soft spot for the Bodum. It always impressed the ladies when I was younger. They thought it was sophisticated, which can tip the balance in those delicate coffee moments. Ah, the stainless steel one looks ideal, I've never seen it before. 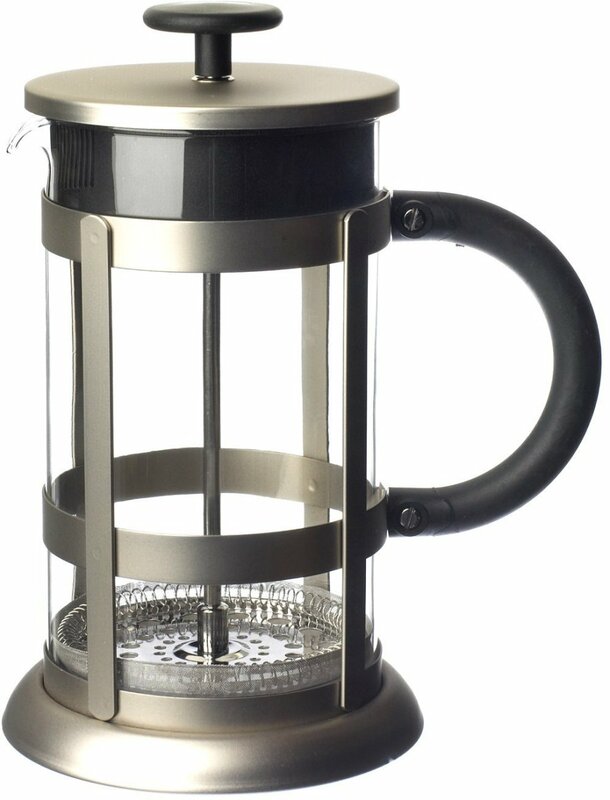 I have such an old coffee press and it may be time to replace it - and the idea of that steel one makes sense - I like coffee kind of hot. Nice to meet you by the way. I'll follow you now so I can keep up!